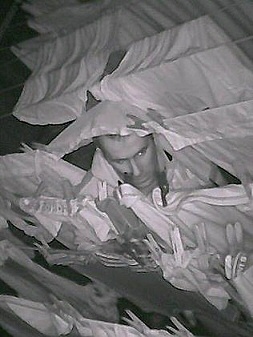 A WOMAN used an infra-red camera to film a man stealing underwear from her clothesline in Melbourne's inner north. Hard to see but the pegs look like the thick white type that have coloured grips on the handles. This is pure overkill on a peg, and doesn't help clothesline grip or handling at all. In this picture they give the impression of rabbit ears. Some of the sheet/tablecloth/nightie items aren't pegged on. This looks like a set-up, as smaller items have 2 pegs. The guy looks like he walked out of an early version of the SIMS family. You cannot trust anyone who uses pegs with external springs. It was the highlight of my year and I sailed into University as a fully-fledged young man of the world. I had sideboards, mauve suit with flares and cuffs - I was IT! And I was still a virgin until I was 23 - le sigh. If you'd done it today, you would have been in the papers. Funny on so many levels, Prof. Made my day. Two levels. It was funny on two levels. Purely unintentional Rammers -- I'm guessing Reiffel as in rifling through something? Maybe eyeful? Maybe he just doesn't look like him at all?? Hello. My apologies but I can stand the color of the site, It's just awful please change it out I really like your site content.